Home » Dillard's » Dillards.com » NV Nick Verreos » NV Nick Verreos Dillard's » NV Nick Verreos Dress Line » NV Nick Verreos Fall 2013 » NV NICK VERREOS.....New "NV Nick Verreos" Dresses Available at Dillard's! NV NICK VERREOS.....New "NV Nick Verreos" Dresses Available at Dillard's! The Anjelica Dress: A printed jersey "Kimono Dress" with batwing-style sleeves and a black faux leather midriff waist "corset". The length hits mid thigh--not too short and not too long. My NV Nick Verreos "Anjelica Dress" really cinches your waist with the very fitted waist detail and for those ladies who want to cover up their arms, it has those great batwing sleeves! This is the perfect dress for the woman who wants to look fashionable, in-style and on-trend. Click HERE to BUY! The Maia Dress: This is my "Little Black Dress" for the Season! My NV Nick Verreos "Maia Dress" a black jersey dress that features a one-shoulder Sari-like drape and black lace sleeves and front neckline. Length is mid thigh--once again, not too mini but not too long. This is the perfect LBD for any Going Out/Night Out On The Town occasion, a nice date, dinner or even a wedding...and yes, since it's for Fall/Winter, I added the arm coverage with the lace 3/4 sleeves. Click HERE to BUY! The Penelope Dress: Even though it's Fall, it doesn't mean you have to stop wearing colors and here's the right dress for those women who LOVE color. 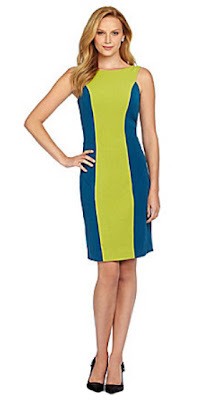 Make a statement with my NV Nick Verreos "Penelope" color blocked fitted sheath dress. 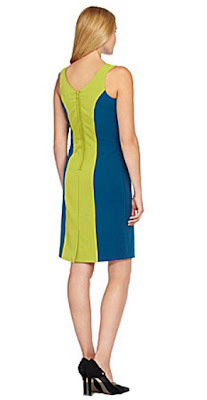 This blue and apple-green dress (the darker color is on the sides for a "slimming" effect) has a high boat neck in the front and V-shaped back (and yes, ladies, you can still wear a bra!). The dress is made of a stretch woven fabric that really holds you in, yet it's quite comfortable. You want to make an entrance at your next meeting, or Sunday brunch? This is THAT dress! 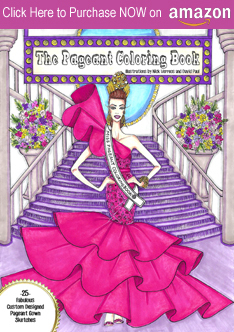 Click HERE to BUY! Check out these three dress--as well the rest of my "NV Nick Verreos" line at Dillards.com HERE! 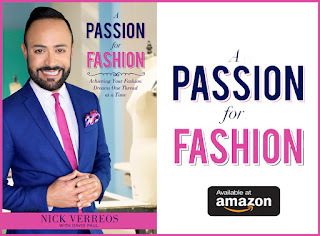 0 Response to "NV NICK VERREOS.....New "NV Nick Verreos" Dresses Available at Dillard's!"